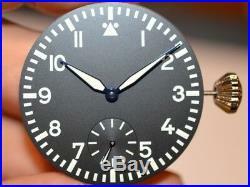 Up for sale is a Pilot dial and hands set with luminous material. 74.1 movement (based on ETA Unitas 6498-2). 21.600 A/h, 56 h power reserve, Sunburst wheels, 19 Jewels. 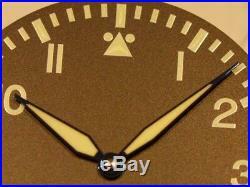 TRITEC luminous material (Swiss Made). The heat-blued hands are made in Switzerland. 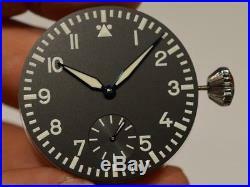 39 mm dial diameter total. 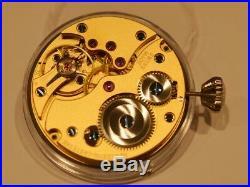 Working with 43 - 45 mm watch cases. 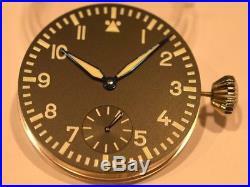 The item "Big Pilot Flieger Aviator dial and hands inncl. Movement ETA Unitas 6498-2" is in sale since Monday, November 19, 2018. 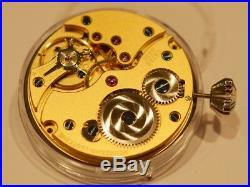 This item is in the category "Jewelry & Watches\Watches, Parts & Accessories\Parts, Tools & Guides\Parts\Movements". 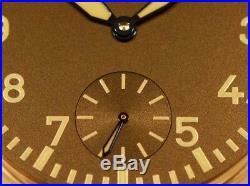 The seller is "tourby_watches" and is located in Hagen. This item can be shipped worldwide.